While it's been an atrocious couple of years for the energy industry, many signs are indicating that we are approaching the bottom. Oil prices have already dipped below the total median cost of production in many countries, which will inevitably cause many firms to stop new exploration projects if they haven't already. We break down the numbers to develop a case for the 'absolute lowest' price, at which point oil will basically turn into a little-to-no downside investment play. Rystad Energy recently released estimates for the total, all-in production cost for one barrel of oil across each of the major oil-producing countries. Note that this includes the cost of discovery, extraction, transportation, overhead, etc. The median producer in a number of countries is already at a point where new exploration projects have become unprofitable, including the U.S.
Of course, the median total cost of production doesn't tell the whole story. There's a big difference between the cost of discovering and producing brand new oil and simply extracting current known reserves. For example, Moody's estimates that it costs an average of $13.68 in the U.S. to bring one barrel to the surface at an existing oil field, or about 38% of the total. As such, firms can continue to profitably produce from current reserves even if they stop exploration. There is also a dramatic spread in these costs across different firms and different countries. With these facts in mind, the median total cost of production is not an obvious lower bound on the price of oil in the short-term. However, it's a great place to start the analysis. So What Does the Total Median Production Cost Tell Us? These numbers are most useful in the longer-term (i.e., 3 to 5 years), once enough time has lapsed to feel the supply shock of reduced exploration. Because the U.S. is now the world's top producer of oil, its median production cost of $36.20 is an excellent proxy for an oil floor in this time horizon. If you buy this argument, oil is already a bit below the bare minimum long-term price. In fact, for patient investors equipped with an appropriate strategy (more on this below), there's a good case to buy anywhere below $35/bbl. However, prices could certainly fall further in the short-term. 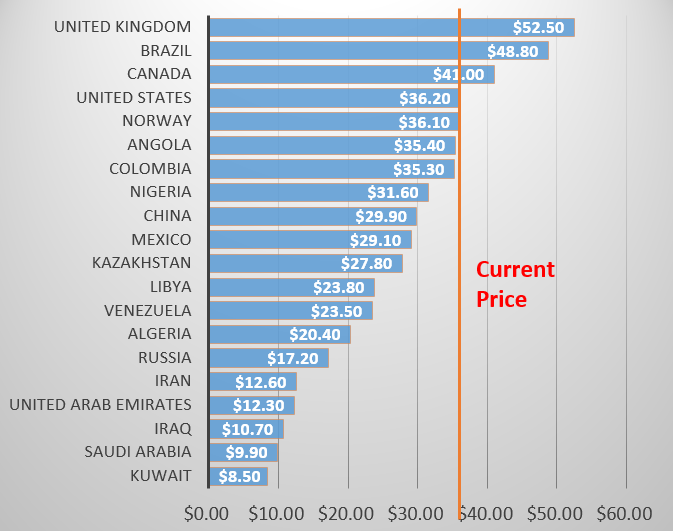 At a bare minimum, the price of oil will never fall below the cheapest cost of production in the world, which is $8.50 per barrel in Kuwait, for obvious reasons. It's also quite impossible that the price would ever fall below the cost of extracting current reserves in the U.S., or the previously mentioned $13.68. If it did, it would lead to a shutdown of operations in most U.S. refineries and an enormous corresponding supply shock. Assuming that Saudi Arabia wants to be as aggressive as possible in bankrupting the future prospects of US shale companies, this means it would be willing to accept a price as low as $20/bbl. However, it would have no reason to let it fall further than that, nor would prices remain there for any more than a few months. This would just be used as a temporary measure until enough companies go bankrupt and loans for new exploration have sufficiently dried up. Supporting this logic is the recent report from Goldman Sachs quoting a similar number. So there you have it: prices could feasibly reach a bottom of $20, but will more likely stabilize around a minimum of $40 within a few years. What's the right investment strategy? If prices do approach the low-to-mid $20s this year, it will be a fantastic time to buy. However, it is notoriously difficult to time the bottom, so it may be smarter to consider dollar-cost averaging in anywhere below $35, and incrementally adding to your position if prices continue to fall. However, it is crucial that you utilize an appropriate long-term investment strategy that doesn't suffer from drag (such as contango). One expert energy investment advisor, Hedgewise, recommends a dynamic portfolio of oil companies with solid balance sheets and a high correlation to the price of oil. Such a portfolio allows you to benefit when the price war ends even if it takes a year or two, and recent performance has proven this approach to be quite effective so far in 2016. Investments like the United States Oil Fund (NYSEARCA:USO) or the iPath S&P GSCI Crude Oil TR ETN (NYSEARCA:OIL) are not sensible choices for a holding period of any more than a month or two. Broader energy funds like the Energy Select Sector SPDR ETF (NYSEARCA:XLE), the Vanguard Energy ETF (NYSEARCA:VDE), or the SPDR S&P Oil & Gas Explore & Production ETF (NYSEARCA:XOP) are quite a bit more reasonable, but will still suffer from a great deal of tracking error for various reasons.